He made his debut in 1963, in Tales of Suspense #39, wearing a cumbersome gray exoskeleton that looked more like a robot than a man. After a re-design, he became an integral member of the Avengers, and he fought evil at every turn - as well as his intense personal demons. 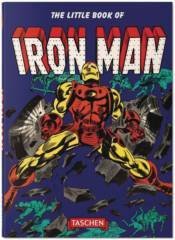 More than fifty years and countless comics adventures later, Iron Man became a box-office smash, and one of the most popular super heroes in the world. Text in English, French, and German.